Have you seen the ads for Rothy’s on Facebook and Pinterest? They seem like incredible shoes, don’t they? Cute, comfortable, sustainable, and cruelty-free? What more could a stylish gal ask for?! Well, how about an affordable price? We’re not all living on the budget of a princess, am I right? Are there any cheaper alternatives to Rothy’s? Don’t worry! As part of the famous “cheaper alternatives” series, I’ve found some cute, budget-friendly options, just for you! 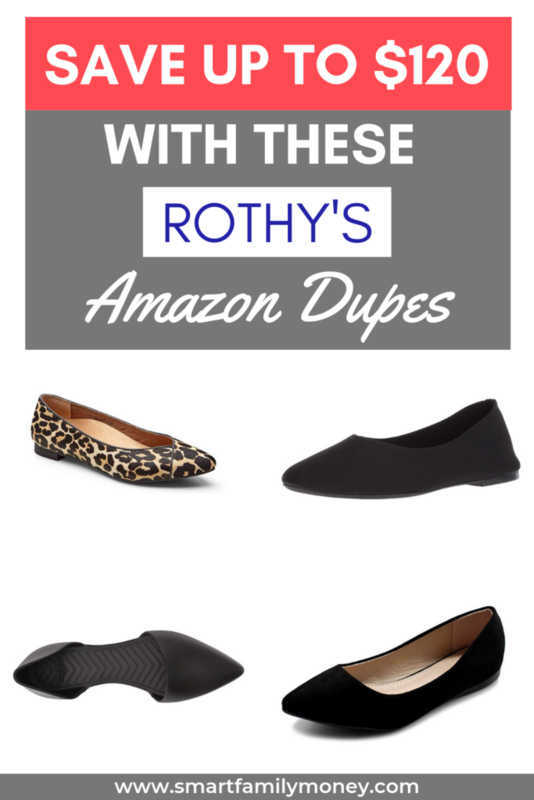 If you read about the cheaper alternatives to Tieks, you know I’m always on the lookout for cute and inexpensive flats. If you’re looking for other cute shoes, check out the cheaper alternatives to Sperry Topsiders and cheaper alternatives to LL Bean boots. Rothy’s are sustainably made knit shoes for women and children. They’re comfortable, stylish, and classic. They’re also pretty famous due to the fact that Meghan Markle was spotted wearing a pair of pointed black Rothy’s. What are the styles of Rothy’s shoes? This post will focus on The Point because it is the most popular Rothy’s style lately. How Much Do Rothy’s Points Cost? Rothy’s Points cost a whopping $145. While they are very nice shoes, that’s a price that’s out of most women’s budget! Are there Cheaper Alternatives to Rothy’s? At $145, almost every other flat out there is going to be cheaper than Rothy’s. While there’s no option that’s identical to Rothy’s in every way, there are some great cheaper alternatives to Rothy’s. Which you choose will just depend on what you’re looking for! Here are the top 4 best options I found. More details are below about each shoe. Vionic Caballo ballet flats are a very supportive stylish pointed flat. While they’re not the cheapest, they’re still quite a bit less than Rothy’s. These are a great option if you are on your feet all day. Available in half sizes and wide width. Comes in a variety of colors and patterns (including leopard!). Native Shoes Audrey are an EVA pointed flat (made of a material like Crocs). They are cruelty-free and recyclable. Only available in whole sizes. Sketchers Cleo flats are the most similar in fabric to Rothy’s, although reviewers note that they’re a bit stiffer. Ollio Ballet Comfort Flats are a great budget-friendly alternatives to Rothy’s. They’re comfortable and classic. Available in a variety of colors and patterns. Available in whole and half sizes up to women’s size 11.